← Vault migrations? No problem! Data Standard builds on top of WPF (Windows Presentation Foundation), so more or less everything supported by WPF can be done with Data Standard. The options are endless, however today I’d like to introduce context menus. $text = $text -join ","
The first function copies some properties of the selected file into the clipboard. 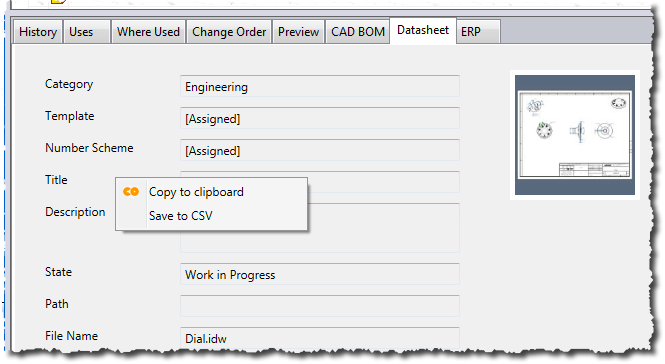 We use the standard .Net function SetText, which is in the assembly Windows.Forms.Clipboard. Just pass any text to the function and it will be in your clipboard ready to be pasted. As you can see, I collect the several file properties into an array ( @(“…”,”…”,”…”) ) and then transform it into a comma separated string via the –join parameter. You would say “why not create the string as comma separated in the first place?”. Good question, but I was willing to show you this little genial parameter –join which allows you to easily transform an array into a string with the separator you prefer. This are the little things that makes PowerShell so great. For a developer, transforming an array into a string is not a big deal, but for a non-developer, this could be a big headache. Such small arguments, parameters, etc. makes it by far easier to script rather then to develop. Try it out! You will have 2 menu items for the whole form, and just a single menu item for the TextBox title. So, now It’s up to you. You are free to configure any context menu as you like. Of course you can have nested menu items and separators. Have fun! And here is the complete code. This entry was posted in Data Standard, PowerShell. Bookmark the permalink.